It's not often that anybody who commutes has something good to say about train lines, however the collaboration between Network Rail and Shakespeare's Globe Theatre makes me feel all warm and fuzzy. The activity celebrates the opening of Blackfriars South Station , the first new station built on the South Bank for 120 years. 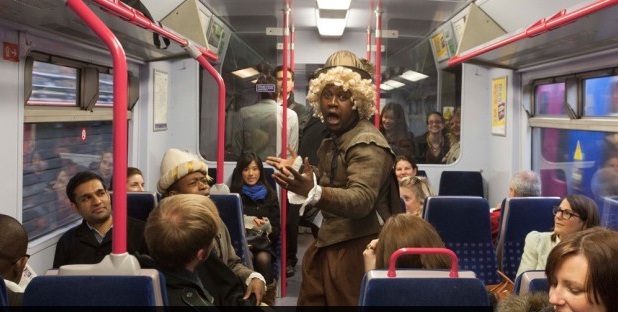 Passengers on board the trains were treated to performances by the award-winning Two Gents Productions who entertained the commuters with short acts from 'Two Gentleman of Verona'. ctors commuters alighting at Blackfriars South platform were given a further surprise when they were serenaded by hip-hop comedy due Abandoman. I love the idea of on-train entertainment and I'm sure it brightened many a Londoner's rainy Monday morning. I was surprised to see it didn't get as much press pick up as a stunt like this would deserve.